Have we underestimated Avery Romero Potential? It’s clear baseballamerica.com and the Fish have dubbed their #1 prospect a giant right-handed high-school hurler. Who, on a consist basis cheeses up scouts radar guns to the tune of 100 MPH. Standing at 6’5’’/260 Ibs it’s easy to see why everyone is excited about the high-ceiling future of Tyler Kolek from Shepherd, TX. He possesses tools that are just un-teachable, and at the current age of 19 years-old he already has a progressive feel for two of his off-speed options, in his slider and curveball. Working to master his change-up, and gaining control of his arsenal in the strike zone so he doesn’t come out Rick Vaughn’ing the batter’s boxes like the plates got the plague. Only further seasoning will give us more insight into his future, but for the 2015 season is he the true number one? Drafted by the Marlins in the 3rd round of the 2012 draft, this scrappy-aggressive style player has been eating up pitchers early-contact fastballs through the minor league system achieving promotions all the way up the ranks to Class A-Advanced Jupiter Hammerheads. Romero doesn’t wait for the game to come to him; he brings his energy and excitement to the game – Proven by his aggressive Vladi G. approach at the plate, effortless arm strength from second and strong hands, which could translate into increased power numbers as he fills out. With a majority of Avery’s homeruns coming in 2014, during which he hit 5 of his 11 minor league career homeruns – a high percentage of them to his pull side of the field. We are going to have to wait and assess how the power comes along and contributes to his future slash statistics. But the steady build up in maturity and earnest to improve his footwork in the infield, paired with the tremendous raise in production on the offense side of the ball, all make him a strong consideration for the Marlins #1 prospect rating. With all these strange similarities, it’s hard to argue that the future doesn’t look bright for Avery Romero. Though, I may have leaped into the world of wild imagination and large skepticism, that’s the glory of ranking prospects. 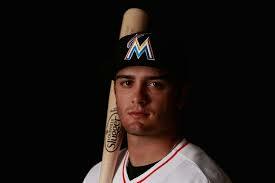 Who’s to say he can or can’t turn into the next Dustin Pedroia or the next greatest Marlin. With the current upgrades of Dee Gordon and Martin Prado, the grand idea that Romero could shift over to third base and Martin Prado could be that plug player. Should get us excited to think we could be seeing Romero in the Show very soon. So, with these facts at hand, and regards to other top Marlin prospects like Justin Nicolino, Tyler Kolek and J.T Realmuto. I have to give my #1 prospect vote to Avery Romero.